It seemed like every single time I was beginning to like Ember as a protagonist, willing to set my annoyance at her petty thoughts and stupid actions behind me, she did something, once again, to make me want to fling my book across the room. Actually, there were a couple of times when I did slam it on the floor, taking advantage of the fact that I was holding a physical book in my hands for once, instead of my fragile Kindle. Anyways, I digress. Ember seemed to contradict herself every other line. At one moment, she would call Chase a monster, someone she didn't even recognize anymore, and in the next, she was pleading with him to help her and her mother escape, screaming at him when he didn't, even when there was absolutely no possible way he could accomplish what she was asking of him. One minute she trusted him and felt nothing but safe in his arms, and then all of a sudden she was afraid of him, flinching at every move he made towards her. Make up your mind, woman! She seemed to think that the whole world revolved around her, that everything would end up working out in the end if things were done her way. Ember never thought out her plans nor did she think about the consequences that would follow soon after. She ran on instinct alone, and because of that she wound up running face first into trouble more often than not. Although she did fight back when she was in danger, she reminded me a lot of the damsel in distress type that I despise so much. Luckily, there was only one love interest in this novel. Thank God! I don't know if I could take the angst level if there were two men vying over her affections. Chase was logical; he thought things through before executing his plans, unlike the impulsive Ember who failed to see the bigger picture. He knew when the odds were in his favor, but he also knew to surrender and fight another day when there was no possible way of winning, or a very low chance of escaping with his life and Ember's intact. I can say with the utmost certainty that Ember did not deserve Chase, at all. If she changed her...well...entire personality, then maybe. But the childish, jumping to conclusions way she acts right now? Definitely not. This first sixty or so pages were pretty slow paced. I probably picked the book up and set it down dozens of times. The plot, the characters *Cough,Cough Ember*, and the world building just couldn't hold my attention. Everything was very Blah, and I even found myself falling asleep in a couple of scenes. However, once I passed the sixty page mark, the novel picked up speed gradually, and I soon found myself enjoying the storyline, despite the difficulties I had with the protagonist. Even though I thoroughly enjoyed the plot after that mark, the world building left a lot to be desired. I couldn't, and still can't, imagine the world there living in. 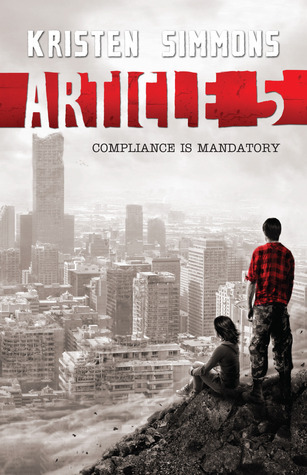 Overall, Article 5 had weak world building, a great plot once you reach a certain point, a very yummy love interest, and an annoying, impulsive protagonist who I hope will grow in character throughout the next installment. I would recommend this book to anyone who loves dystopians, is in the mood to drool over a swoon worthy guy, and who doesn't mind a whiny, self-centered protagonist. Would've been a five if there was a better protagonist. Slow at first, but the action gradually increased as the novel progressed. Yes, I so agree! I thought Ember was really whiny, and that Chase on the other hand was nice and Ember didn't deserve him. And I agree, there was a definite lack of world-building. Great review! Glad to see people share my opinions! :D Thanks for reading. I've been looking at this book for a little while, but I just can't find it in me to get really excited over another Dystopian, or Classic Style Dystopian as I prefer to call them. A great Dystopian is a joy to read, but the fascination is hard to come by at this point. Unless it strays off the beaten path or is really well written, there are just more exciting books. This doesn't apply to books like Unwind or The Drowned Cities, which are just om the fringe of Dystopian, and make up a new wave of them. Over all, good review! You'll be getting a follow. I actually really liked this at the time, but I do think agree with a lot of your points. I haven't read the sequel yet, but I'm looking forward to it. Great review.